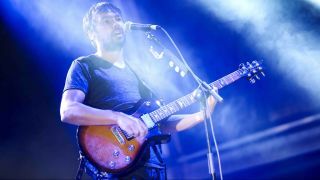 Over nearly two decades of hard graft, The Pineapple Thief have established themselves as nouveau prog darlings, with guitarist and frontman Bruce Soord masterminding the group’s songwriting and direction. Their efforts culminated in last year’s majestic Your Wilderness, a more sweeping, cinematic take on TPT’s sound, complete with guest appearances from Supertramp’s John Helliwell and Caravan’s Geoffrey Richardson. Accordingly, the band have stepped up their live game, adding King Crimson/The Porcupine Tree drummer Gavin Harrison and Godsticks guitar solo supremo Darran Charles, who you can see when the embiggened Pineapple Thief tour Europe in September. “In our early days, our agent somehow got us a decent slot at a German mainstream festival. Before us was a party rock band, getting the crowd whipped up into a drunken frenzy: “Now all the girls!” etc etc.